Sometimes you encounter a project so big, it’s hard to wrap your head around it. Consider company culture. It involves the entire organization, has many facets, and there’s no blueprint to follow to make it work. But culture is one of the core tenets a company should implement to ensure the business thrives over time. 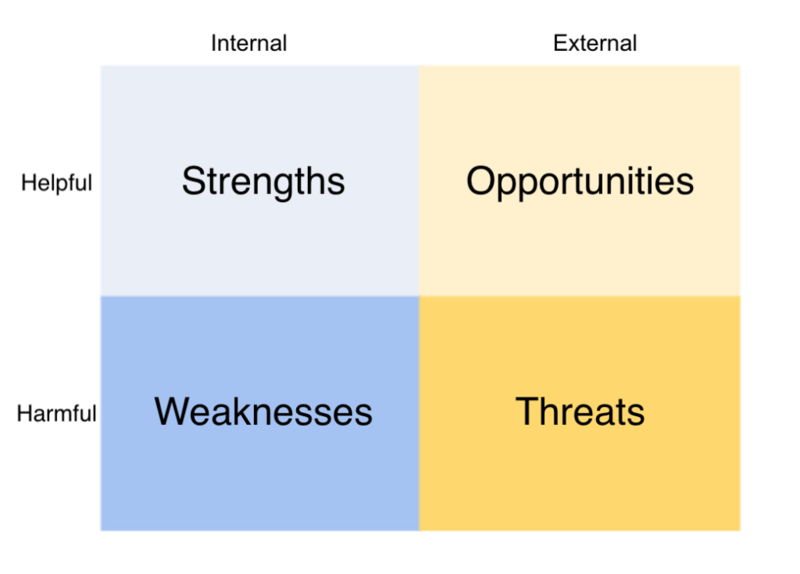 SWOT analysis — which stands for Strengths, Weaknesses, Opportunities, and Threats — is a visual way of breaking down such problems into manageable parts. And it’s not just for business school grads. Organizations from restaurants to libraries use SWOT to make crucial decisions. You can even do a personal SWOT analysis to assess your own goals and how you currently measure up. By looking at your company from the perspective of a SWOT chart, you can step back and look at the macro factors that affect your business. For decisions that change the future of your team or company, such as the overhaul of internal process, a new business focus, or deciding whether to build new products, SWOT can help you create a strategy that’s destined for success. At its core, a SWOT chart is a project management planning tool. It helps determine the course of future action. 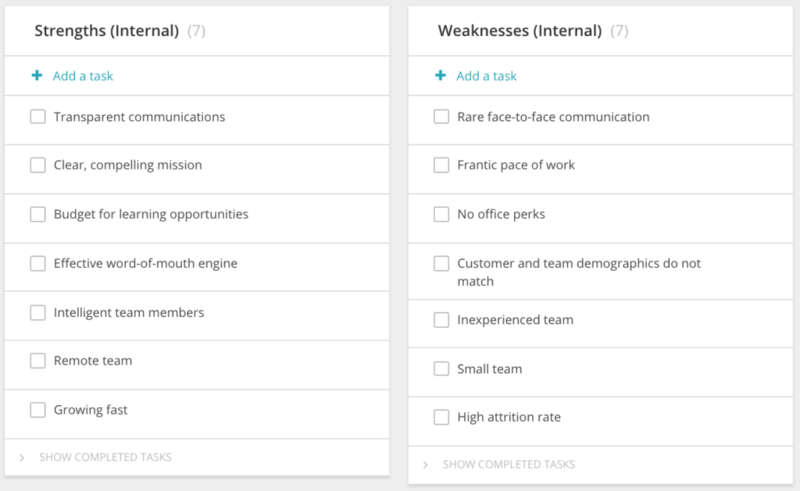 Unlike a Kanban or Gantt chart, though, SWOT doesn’t lay out tasks and due dates. It displays observed qualities and top-level data. SWOT is a descriptive tool that deepens understanding, rather than a prescriptive one that tells you exactly what to do. In a SWOT matrix, data is arranged in four categories and two subcategories. The two subcategories are Internal/External and Helpful/Harmful. Internal factors are the features of your business you can control. External factors are those outside of your control that nevertheless affect your outcomes. Helpful qualities are your advantages, and harmful ones are your potential downfalls. Strengths are the positive attributes of your business — the resources, experience and assets that are readily available. What does your business do well? Where is your competitive advantage over other businesses? Weaknesses are the negative aspects of your business — the limited resources, experience, skills or assets that hamper your ability to compete well in your market. Where does your business need to improve? Opportunities are external factors that are potential sources of growth for your business. These situations or trends can offer favorable circumstances for expansion and improvement. What new opportunities do you see that your business can take advantage of to drive growth? Threats are factors external to your company — and beyond your control — that impact your business revenue or profit. What are the potential outside threats to your business? Which are priorities for you to develop contingencies to address? Each quadrant helps you think realistically about where you stand now, both within the context of your company, and within the greater context of your industry. When several contributors fill out the SWOT chart, you’re gathering the collective self-knowledge necessary to move forward. Let’s consider a potential scenario in which a SWOT analysis can be used to implement or refresh your company culture. Whether your company is growing, changing direction, or simply checking in on its goals, SWOT can help you make decisions at scale. For example, a SWOT analysis can help jumpstart a more structured approach to company culture. When you think about how to build a successful company culture, you have to look both inside and outside to see what advantages you already have and where you need to improve. Once you create your SWOT workspace, you can start brainstorming right away. It doesn’t really matter which of the four categories you start with, as long as you devote equal attention to each. SWOT categories can be displayed as quadrants or in a Kanban-style timeline. In the timeline view, qualities take the place of tasks. When displayed in this view, you can begin to find connections between the items in each category, and separate items that are in your control from items that aren’t. Once you’ve created your SWOT template, it’s time to start filling it out. Try starting with the internal factors, strengths and weaknesses. When considering your strengths and weaknesses, it helps to use neutral language grounded in fact. That way you can discuss each item without judgment, as a way to avoid naval gazing. The goal is to problem-solve for the future, not get caught up in the pride or shame of what you’ve achieved in the past. In the Timeline view, the internal categories Strengths and Weaknesses are side-by-side. Each quality is descriptive without suggesting action. Some qualities are multiple kinds of resources. Since this is a culture evaluation, perhaps there are more organizational and human resources listed because those resources are most relevant to the discussion. As the lists build, you can start to see where strengths and weaknesses match up, and form discussions around those matches. For instance, communication is transparent, but employees rarely talk to each other in person. How does this affect the bonds and level of trust between coworkers? What would you like communication to look like in the future? Some items in your SWOT chart are indifferent to your team’s motivation to change. It’s important to be aware of these macro factors such as economic trends, competition, and new technology so that you are adequately prepared to seize the advantages and confront the challenges that these forces bring. Both opportunities and threats are critical to your business and can’t be ignored. 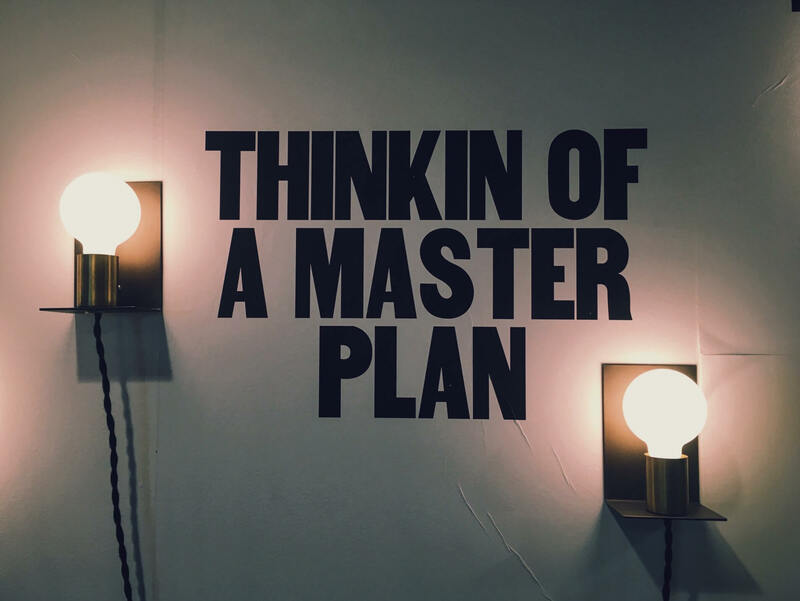 Though you might want to focus on the areas you can control, the factors you can’t plan for can be just as beneficial or detrimental. External factors in the marketing agency’s SWOT analysis. These opportunities provide the favorable circumstances that will help the agency bring their culture to the outside world, attracting high-quality talent that will continue to grow it. Your company needs to be aware of external threats, too. While you can’t squash or prevent threats, increased awareness helps you minimize harmful effects. These adverse factors all threaten the success of the company, and thus the success of its culture. Like with internal factors, you can see how opportunities can balance out threats. In the example, the high demand for remote jobs may be used to mitigate the effects of graduate schools and competitors luring talent away. By coming up with ways to soften threats, the agency can make sure its culture survives and thrives through ups and downs. When we’re caught in weeds of daily work, we don’t often think about the big picture. If we do, it’s in abstract terms. SWOT is a high-level tool that helps us move abstract ideas about major topics into visual, actionable form. But the SWOT chart is just the beginning; the real benefit lies in the analysis of the data laid out on the diagram. By drawing comparisons between the opposing categories, and seeing which strengths and weaknesses are in your control, you can start to have discussions across teams that lead to real change. As a manager or executive, the internal and external lists will help you see which areas you need to devote resources to, and which current strategies dovetail with trends in your industry and beyond. Once you’ve clearly defined the issue you want to explore, it’s easy to set up your own SWOT analysis. 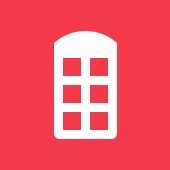 Create a new SWOT workspace in Redbooth, invite your team, and start SWOT-ing away!